There was a story told by Anthony Sherman, a military officer that served under General George Washington, who was present with Washington at Valley Forge during the terrible winter of 1777. 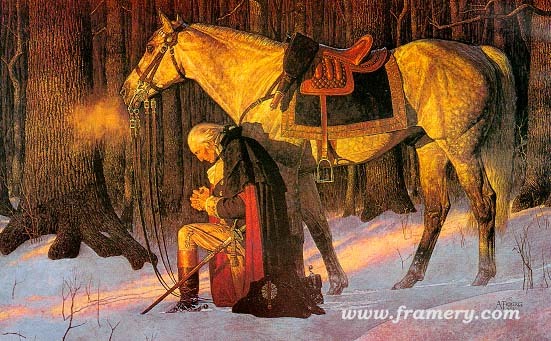 It seems that Washington was visited by an angelic being that gave him visions of the new nation that was to be the result of the war Washington’s rag-tag army was fighting. Whether Washington really experienced these visions, or Sherman just made up the story, is not important at this point. What is troublesome is the accuracy of what has happened in this nation since the story was first published in the newspaper National Tribune in 1859. In this vision, as allegedly told to Sherman directly by Washington after it happened Washington learned his army would win the Revolutionary War and establish the Union. After that he had a vision of two more great tribulations; the Civil War and finally a great war fought on the soil of the United States. Washington may have actually been shown the nation’s involvement in World Wars I and II which had a different outcome than he envisioned. The reader may be the judge of this. “I do not know whether it is owing to the anxiety of my mind, or what, but this afternoon, as I was sitting at this table engaged in preparing a dispatch, something seemed to disturb me. Looking up I beheld standing opposite me a singularly beautiful female. So astonished was I, for I had given strict orders not to be disturbed, that it was some moments before I found language to inquire into the cause of her presence. “A second, a third, and even a fourth time did I repeat my question, but received no answer from my mysterious visitor except a slight raising of her eyes. I would have risen, but the riveted gaze of the being before me rendered volition impossible. I assayed once more to address her, but my tongue had become useless, even thought itself had become paralyzed. A new influence, mysterious, potent, irresistible, took possession of me. All I could do was to gaze steadily, vacantly at my unknown visitor. “Gradually, the surrounding atmosphere seemed as though becoming filled with sensations and luminous. Everything about me seemed to rarefy, the mysterious visitor herself becoming more airy, and yet more distinct to my sight than before. I now began to feel as one dying, or rather to experience the sensations which I have sometimes imagined accompany dissolution. I did not think, I did not reason, I did not move; all were alike impossible. I was only conscious of gazing fixedly, vacantly at my companion. “At that moment I beheld a dark, shadowy being floating in mid-air between Europe and America, dipping water out of the ocean in the hollow of each hand. He sprinkled some upon America with his right hand, while with his left hand he cast some on Europe. Immediately a dark cloud raised from these countries and joined in mid-ocean. For a while it remained stationary, and then moved slowly westward, until it enveloped America in its murky folds. Sharp flashes of lightning passed through it at intervals, and I heard the smothered groans and cries of the American people. “At this the dark, shadowy angel turned his face southward, and from Africa I saw an ill-omened specter approach our land. It flitted slowly over every town and city. The inhabitants presently set themselves in battle array against each other. As I continued looking, I saw a bright angel, on whose brow rested a crown of light, on which was traced the word ‘Union,’ bearing the American flag, which he placed between the divided nation, and said, ‘Remember ye are brethren.’ Instantly the inhabitants, casting from them their weapons, became friends once more and united around the National Standard. World Wars or Future Event? “And again I heard the mysterious voice saying, ‘Son of the Republic, look and learn.’ At this the dark, shadowy angel placed a trumpet to his mouth and blew three distinct blasts; and taking water from the ocean, he sprinkled it upon Europe, Asia, and Africa. Then my eyes beheld a fearful scene: from each of these countries arose thick, black clouds that were joined into one, and throughout this mass there gleamed a dark red light by which I saw hordes of armed men, who, moving with the cloud, marched by land and sailed by sea to America, which country was enveloped in the volume of the cloud. “And I dimly saw these vast armies devastate the whole country and burn the villages, towns, and cities that I beheld were springing up. As my ears listened to the thundering of the cannon, clashing of swords, and the shouts and cries of millions in mortal combat, I heard again the mysterious voice saying, ‘Son of the Republic, look and learn.’ When the voice had ceased, the dark, shadowy angel placed his trumpet once more to his mouth and blew a long and fearful blast. “Instantly a light as of a thousand suns shone down from above me, and pierced and broke into fragments the dark cloud which enveloped America. At the same moment the angel, upon whose head still shone the word UNION, and who bore our national flag in one hand and a sword in the other, descended from the heavens, attended by legions of white spirits. These immediately joined the inhabitants of America, who I perceived were well nigh overcome, but who immediately taking courage again, closed up their broken ranks and renewed the battle.